As a drink, there’s not a lot to say about Club Soda. It’s fizzy water. That’s about it. It works well as a refreshing additive to juices and other drinks, adding a sparkle to the palate, but that’s not all this fizzy wonder is known for. For years, whispers of its incredible stain fighting power have been passed around. Apparently club soda, the simple and unassuming carbonated water, is the ideal first response for spills and stains. Let’s imagine a scene. You’re having a dinner party. People are gathered around talking about the latest exciting movie they were able to see at the theatre, when you come out of the kitchen with a cheese platter and bump straight into someone who was carrying a full glass of red wine. Great. Now you have a nice red blotch on your otherwise spotless carpet. Enter club soda to the rescue. Pour an equal portion of carbonated water onto the stain. Make sure you get the full area. Then use a towel to dab and pat the area dry. Draw up as much of the liquid as you can. Repeat the process to make sure you did not miss a spot. If you have a wet vacuum, you can use this to draw up the soda on the second attempt. If the process is successful, you shouldn’t see much of a stain at all. Why Does Club Soda Work? The power of club soda to fight stain formation comes from the carbonation first and foremost. 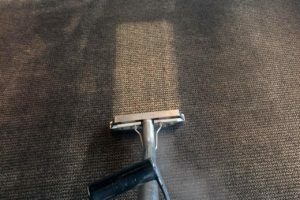 The aeration works to lift stains and prevent them from settling down into the fibers of carpet and fabrics (yes you can use club soda to lift that wine stain from your guests shirt as well). Because it is simply carbonated water, and not an otherwise sticky or acidic substance, there is little danger in using it immediately after a spill. If you have a carpet with a scotch guard, club soda will not affect this. Club soda will also not leave a residue behind like some other commercial cleaners. When a residue is left behind, it can gather dirt to it, and a stain that was thought to disappear will slowly reappear as a dirty mark. Are There Limits To Club Soda’s Incredible Stain Fighting Prowess? Okay, so club soda isn’t exactly the cure for all carpet stains. First of all, if a stain has already settled into the carpet fibers, club soda will do little more than get your carpet wet. You need to react as quickly as possible to prevent the stain. And although club soda will work well for a liquid like red wine, or coffee, you won’t have the same luck with a grease stain, or a burn mark. There are a lot of situations where club soda will work extremely well to prevent a stain, but sometimes you need to know when to ask for help. Call a professional for assistance when a stain goes untreated. We are always willing to help, and if you thought club soda was good at removing stains, just wait until you see us in action.